In a small saucepan, combine water, sugar and basil; bring mixture to a boil over medium-high heat. Boil for 1 minute, reduce heat and simmer for 5 minutes more; remove from heat and let cool. Machine method - Run mixture through an ice cream maker as per manufacturer’s instructions. Serve immediately or put in freezer for future use. If frozen, soften in refrigerator for about 10 to 20 minutes before serving. Yields about 2/3 cup per serving. Freezer tray method - Pour mixture into a shallow metal pan and freeze halfway through, about 20 to 30 minutes. Rake a fork or spoon through partially frozen mixture so it does not freeze into a solid block; return pan to freezer and let freeze. 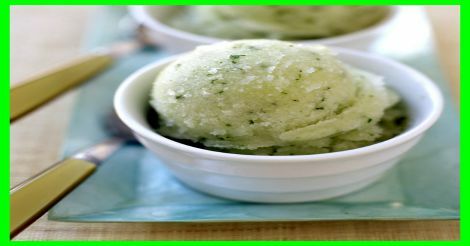 Before serving, run sorbet through a food processor or blender to obtain desired texture. Yields about 2/3 cup per serving. Serve this sorbet alone or pair it with another seasonal flavour like blueberry, raspberry or pineapple sorbet. Or add a sprinkling of summer berries for a dash of colour. Feel free to experiment with other accent flavours, too, such as mint or lemon verbena instead of basil.